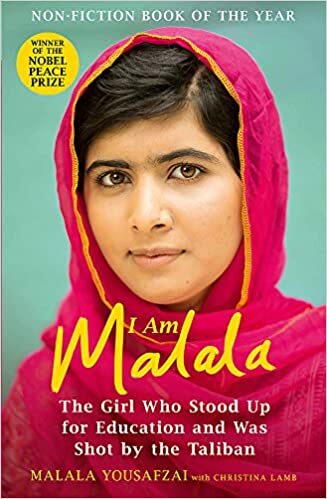 Malala Yousafzai was raised in the Swat Valley of Pakistan, often called the Switzerland of the East since rich people from around the world used to go on holiday there. Almost anywhere you go in Swat, you’ll find the remains of old Buddhist temples. Malala relates the ancient history of the area as if it were her own family history. I liked a lot of the cultural details we find out. Stirring things up is called “putting masala on the situation.” Two line poems called tapae are popular and many of these are sprinkled throughout the book. Mentions of ghost stories like one about a figure called Shalgwatay, a twenty-fingered man or Shashaka, a woman with muddy hands who would turn you into a dirty woman with hair filled with insects if you didn’t bathe. There’s a memorial day called Muharram on which Shias whip themselves with metal chains or razor blades on strings, painting the streets red. Malala’s father was a crusader for education. Since her family couldn’t afford their own house at first, she actually grew up in a school. It was interesting that her cousins from the country considered her sophisticated because she came from a town, however, compared to those living in bigger cities, she would be considered backward. Malala tells us about her childhood. Normal kid stuff including stealing something as a child and trying to get the highest score amongst her classmates. Depressingly, there are the repeated references to Malala using skin lightening cream and wishing her skin was white. Although she loves her homeland, there are problems with it as well. We hear stories of ten-year-old girls being married off or a teenage girl being killed by her family for flirting with a boy. Rival clans engage in unending feuds. There are poor children who use magnets to fish for metal in a mountain of rubbish instead of going to school. After regaining consciousness and recovering from multiple surgeries, Malala didn’t think any bad thought about the man who shot her and had no thoughts of revenge. Miraculously, she survived being shot in the head without any cognitive impairment, although she had to be flown to England to get the best treatment possible and it took a long time for her to recover. She wants to return to Swat, although it isn’t safe for her yet. Despite almost dying, she isn’t backing down and has made it her goal in life to help poor children all over the world. A truly inspiring story everybody should read.